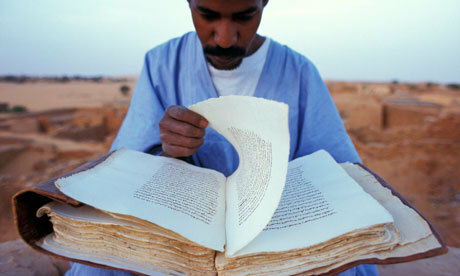 In the village of Chinguetti, once a famous gathering place for scholars to debate the finer points of Islamic law, hidden amongst the encroaching dunes of the Sahara Desert in Mauritania, the inhabitants are the guardians of centuries-old manuscripts, amongst the oldest in Islam. Although largely abandoned to the desert, the city features a series of medieval manuscript libraries. These “desert librarians” are struggling to save this treasure from wind and sand as remnants from the time when Chinguetti was a flourishing city along the caravan route, a cultural lighthouse for poets and scholars alike.